President Lincoln had appointed General Ulysses Grant as Commander-in-Chief of the Armies of the United States. 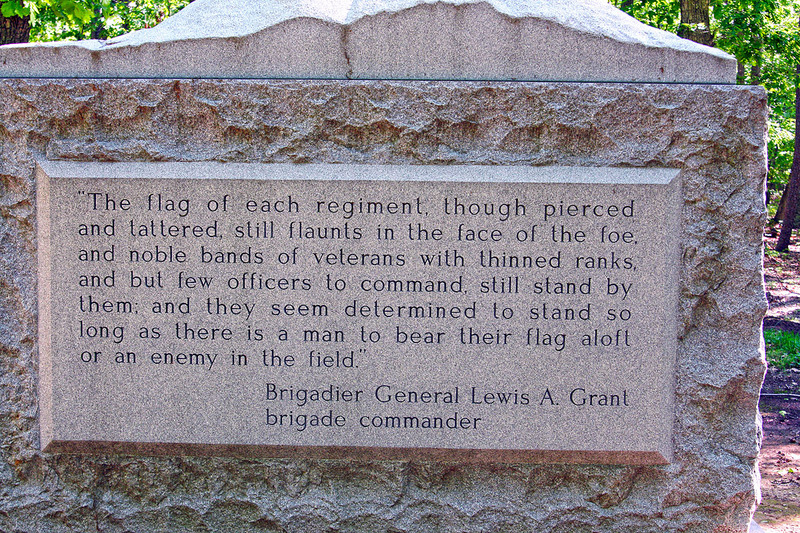 General Grant envisioned a strategy that was different from the previous generals, having a “coordinated overland offensive by three separate Federal armies operating in tandem”. The Army of the Potomac would strike overland towards Richmond in order to force the Army of Northern Virginia into a decisive battle in the open,while at the same time two other Union armies would seize control of the Shenandoah Valley, and move up the James River toward Richmond. 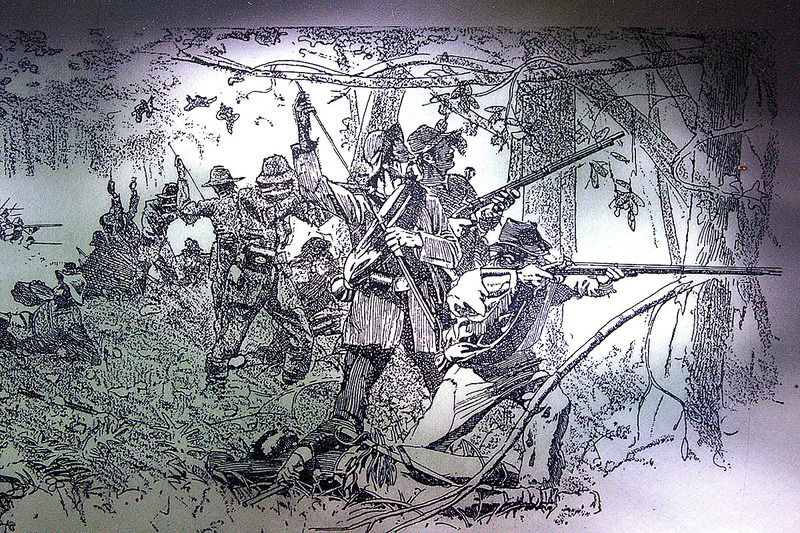 This ‘Overland Campaign’ of the Army of the Potomac would prove long and costly for the Old Vermont Brigade. “no women, no matter who they are”, should be allowed in the army longer. “Many of the most prominent officers of the 6th Corps signed a petition …. praying I might be allowed to remain and keep my team and delivered it to Secretary of War Stanton.” He wrote the following on the back of the petition. “I was obligated to go, having to sell my team at a great sacrifice and abandon many articles of use and value, for want of time and transportation to take them with me.” So ended all her preparations of the winter for the summer’s campaign. 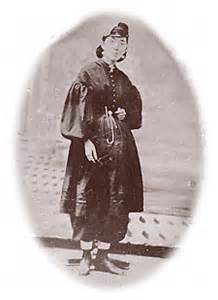 Hardly three days of grace remained in which to dispose of her team and other personal property so it was at great personal loss that she left the army about the 1st of May 1864. 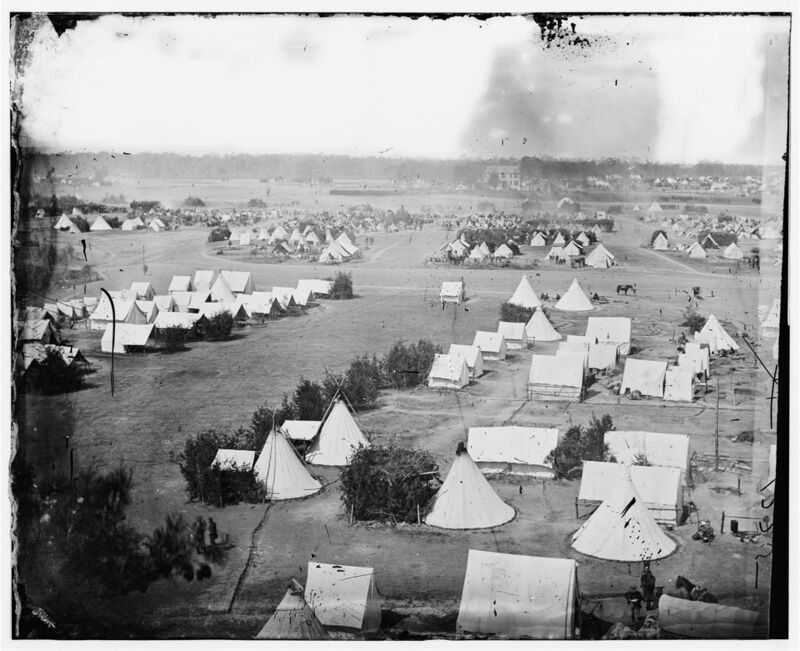 A few days before the Overland Campaign was unleashed, Amanda was ordered to report to Washington D.C. and specifically to Dorothea Dix who was in charge of all the female nurses. Amanda found a ride to Washington D.C. and to the house of Dorothea Dix on 15th Street around the corner from the White House. 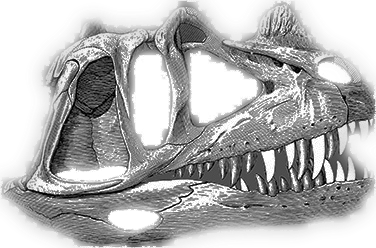 Amanda was well kept, but had been in the field for almost three years. From the time she entered the army, Mrs. Farnham had worn a dress similar to the ladies’ cycling costume of the present , – full pants buttoning over the tops of her boots, skirts falling a little below the knee, and a jacket with tight sleeves. This dress she had on when she called to present her papers and request. The image above is from ​a website focused on Civil War Nurses. The website section “how they dressed” contains the image and defines this image as a “bloomer costume”. The image is not Amanda Farnham. The website text states the following about the dress. 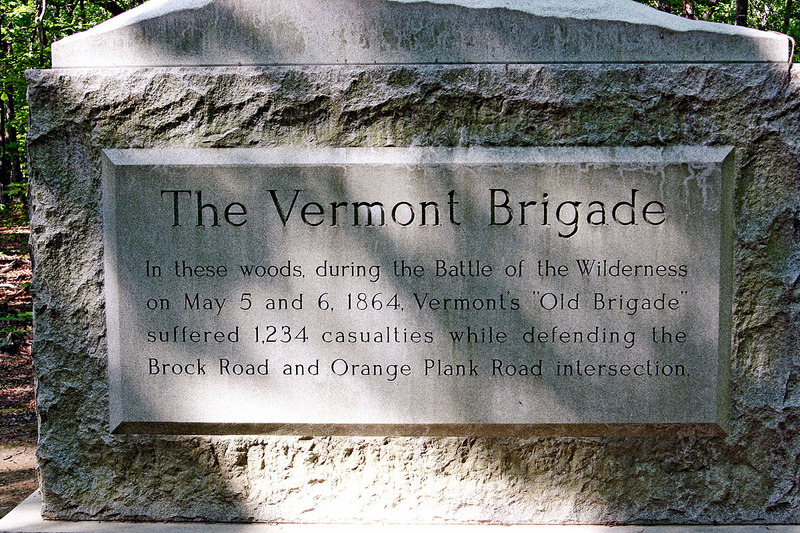 The Wilderness would prove to be one of the most significant battles, and the deadliest, for the Vermont Brigade. 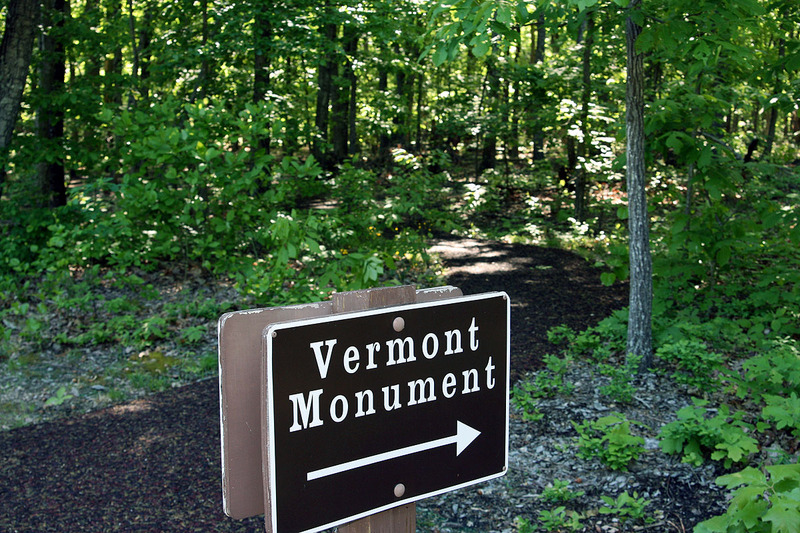 May 5, 1864 was the deadliest day of the entire war for the Vermonters. The brigade would suffer 1,269 casualties, with 364 killed. 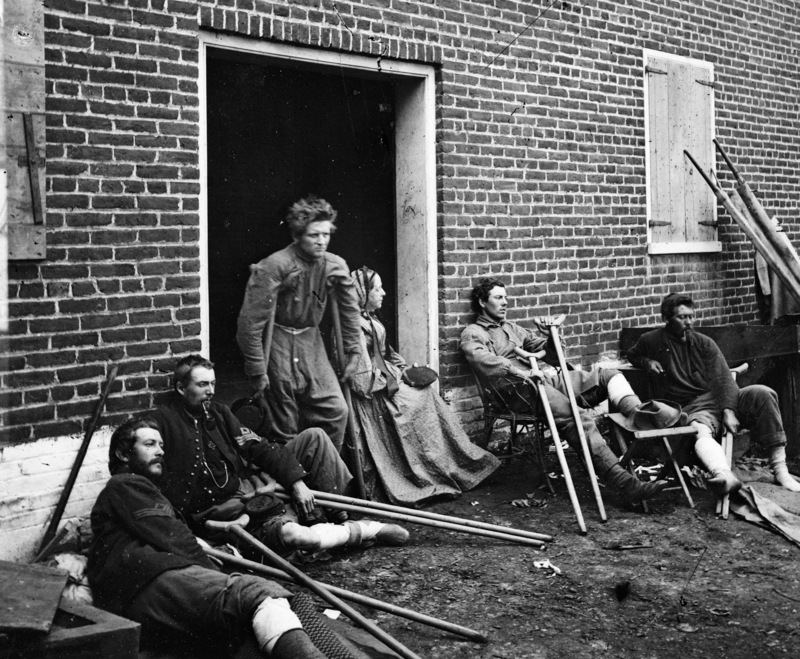 The wounded were moved to hastily established hospitals in Fredericksburg, but they were soon overwhelmed. “…the first day…I was ordered back to the field Division hospital where I had to operate all that day and nearly all night. We put up 30 large hospital tents, which were crowded with the wounded while 1500 men lay on the ground around suffering the most heart-rending cries of agony. We numbered 5 or 6 surgeons and it took us about 3 days to attend to them and then many had to be moved in army wagons and ambulances without having their wounds dressed at all! All this time the ambulances continued to bring in the wounded of our Division and the cannonading and musketry was almost deafening. O’ it was terrible to hear the poor fellows cry for water or in piteous tones cry out to any surgeon that chanced to pass near them for help. 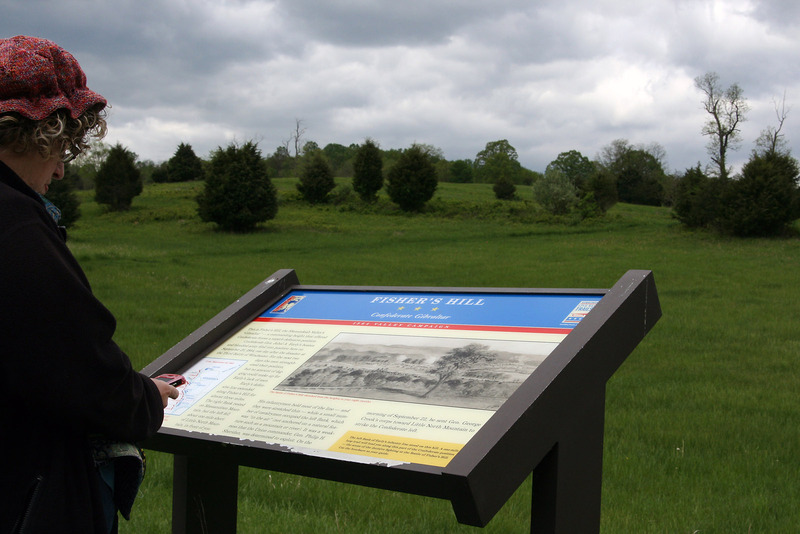 The third night we left this place and moved on about 9 miles and established our hospital on the ‘Old Chancellorsville’ battlefield called Cherry Locust Grove 3 miles from Chancellorsville. It was here that Amanda would once again receive pay for her work, something that had not happened for two years, since December, 1861. 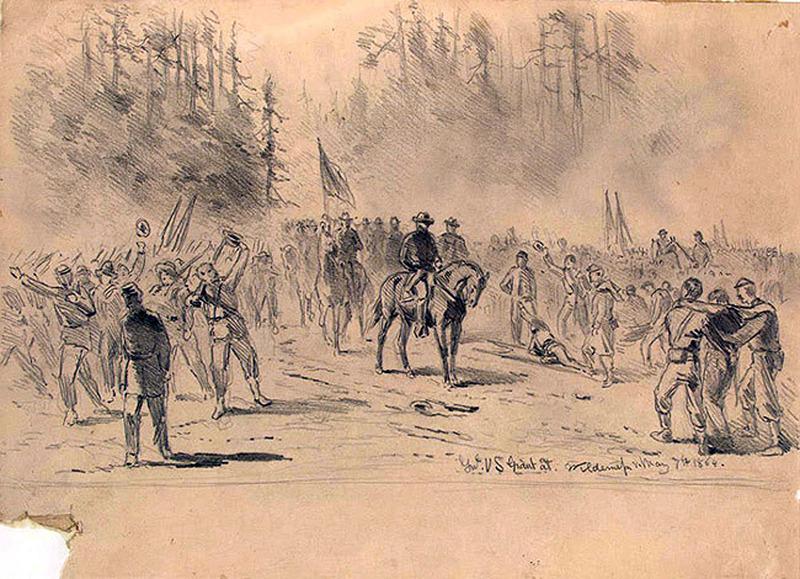 When Amanda reported, she would have, at some point, received the news that her brother Henry had been wounded in the Battle of the Wilderness. (His military records state that he was wounded on May 6, was sent home to the U.S. General Hospital in Brattleboro, Vermont, and mustered out on July 27, 1864.) 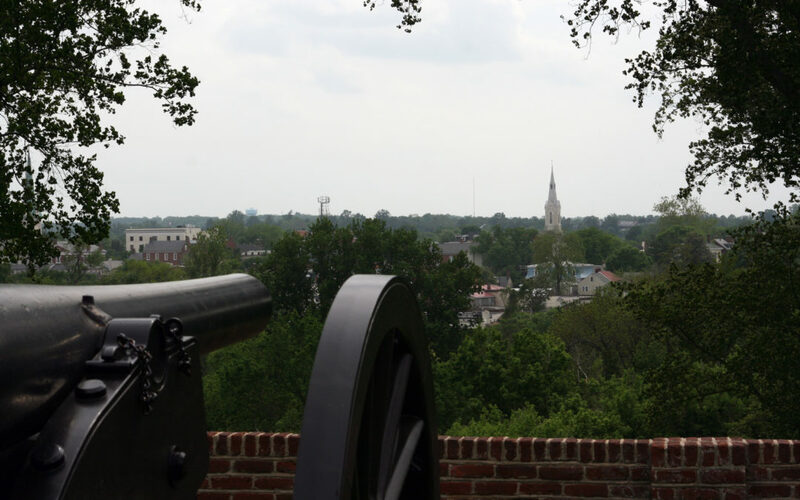 It is unknown whether Amanda actually saw Henry there in Virginia, or if he’d already been sent on, but again, she must have wished that she could have cared for him, and accompanied him home. …..But she had necessary work to do, right where she was. With such overwhelming numbers of wounded, only the most severe cases could get a ride in an ambulance, so most of the wounded, including some amputees, had to walk. The first ambulance train, consisting of 488 ambulances and 325 wagons carrying 7,000 wounded, arrived in Fredericksburg on May 9, a full 3-4 days after the battle. When news of this situation reached Vermont, Gov. 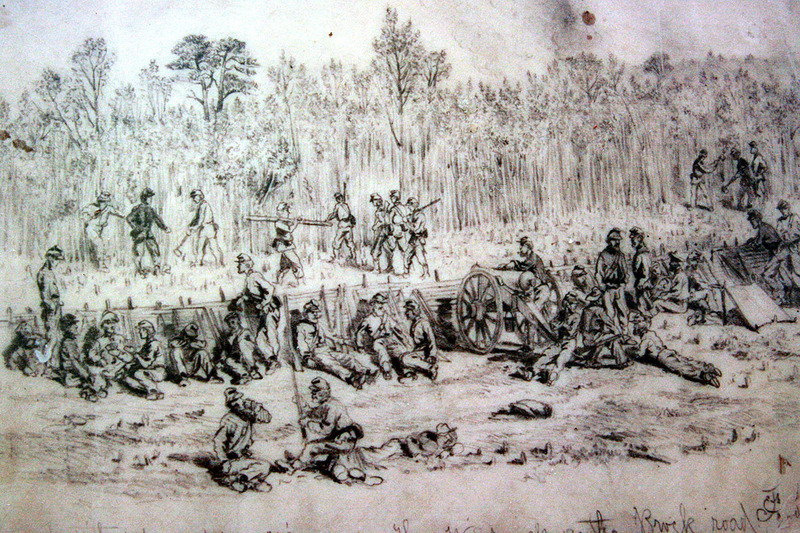 Smith and twenty of the state’s doctors and surgeons headed south, arriving on May 16, to help with the wounded. The White House on the Pamunkey had been the plantation house of Martha Washington. At the time of the Civil War, the wife of General Lee was living there, but the Union Army took it over to use as a supply house and, later, a hospital. 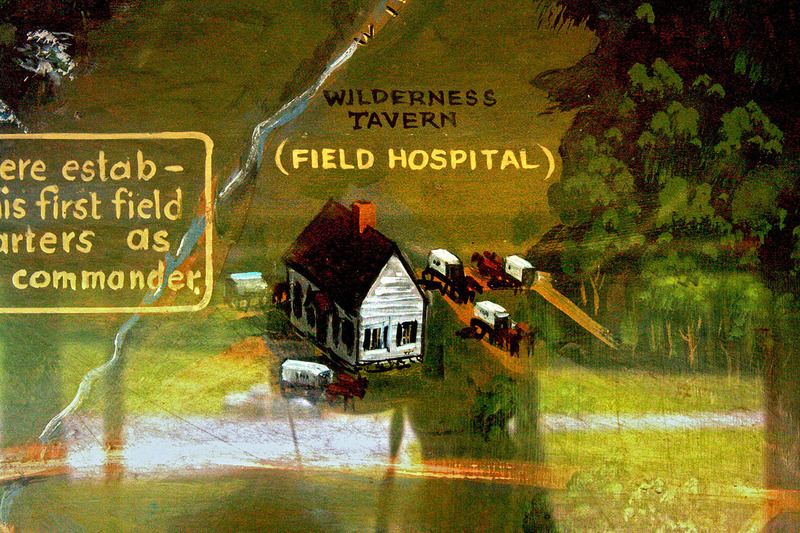 So Amanda followed the field hospitals, and her wounded soldier boys, to the White House on the Pamunkey, and it was here that she recognized that previous uniform practices were unsustainable and instituted one of her innovations. 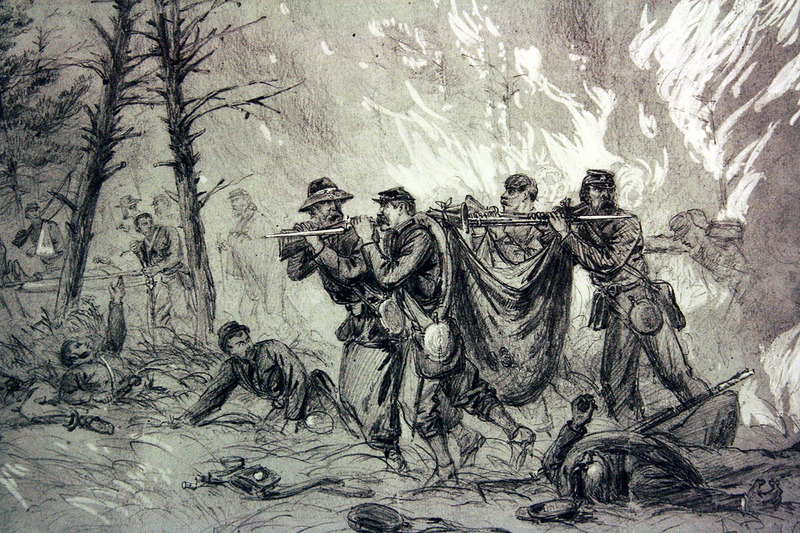 “It was at the latter place that I first put into practice a plan to which the changes of clothing of the wounded = then coming in by the thousands from Cold Harbor = could be washed and saved for use again, and not burned or destroyed as had been done at some former places, and some way by which the clothing and bedding of the wounded should be saved had become a necessity for supplies of this kind were nearly exhausted. 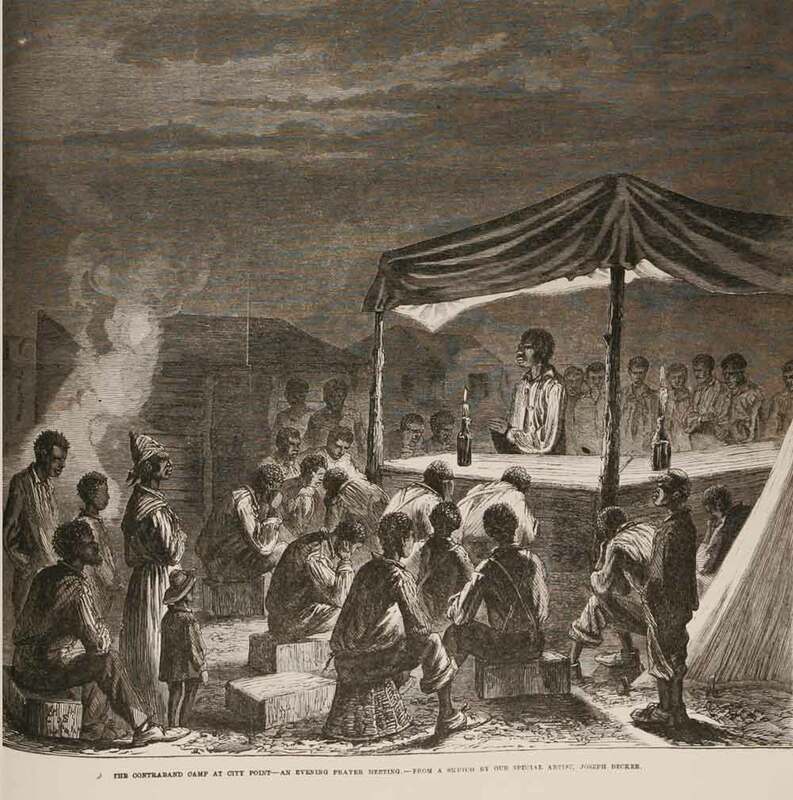 “At this time there were many colored women-contrabands coming into White House Landing who had to be provided with food and quarters by the Quarter Master, and no means had as yet been found to make them other than a burden and hindrance, besides they were exposed to the soil influences of camp followers and others who crowded about the army supply depots and hospital grounds. 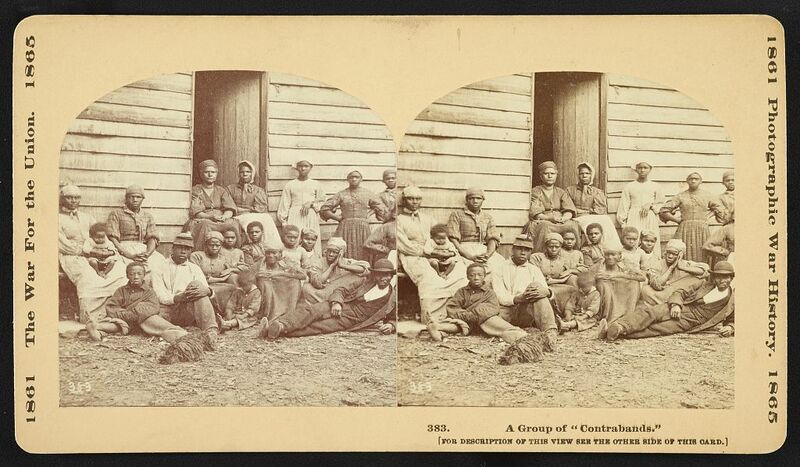 Stereograph showing a group of former slaves including men, women and children gathered outside a building at the Foller Plantation in Cumberland Landing, Pamunkey Run, Virginia. Photographed by James F. Gibson. 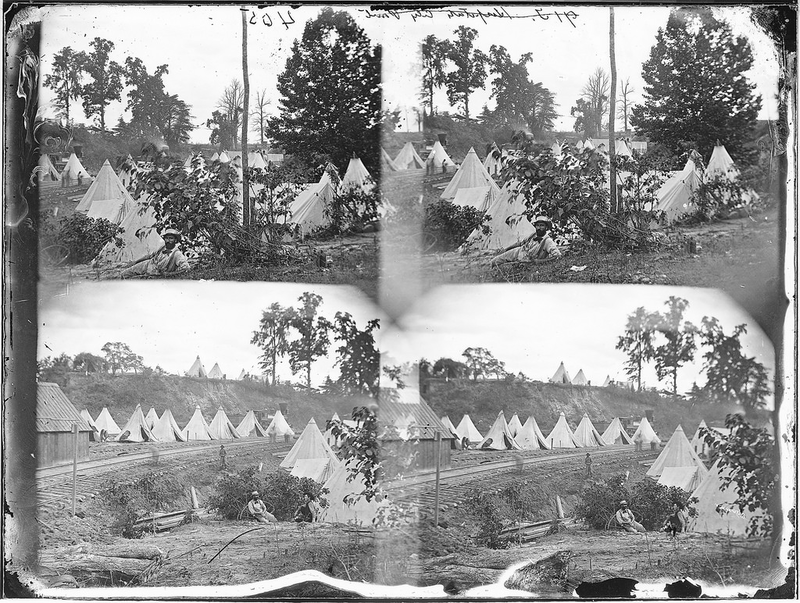 Part of Civil War glass negative collection. Library of Congress. 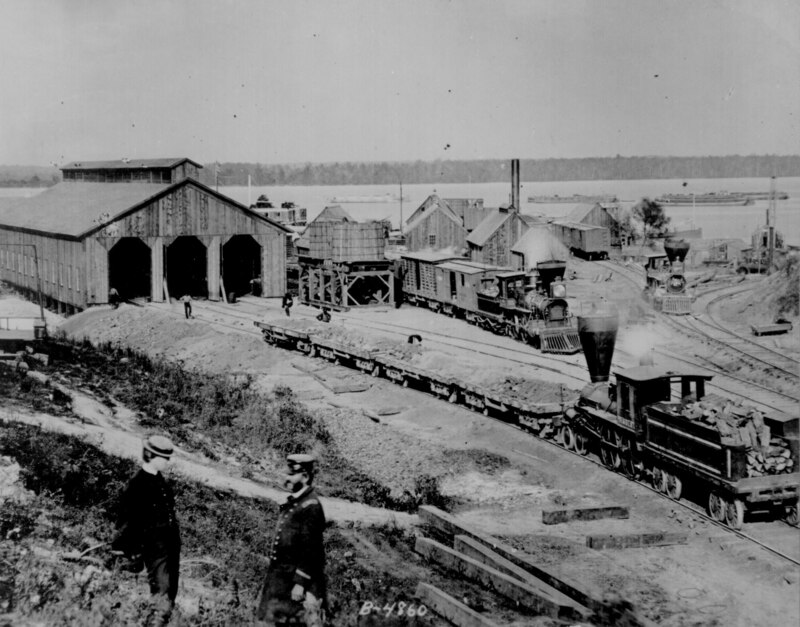 Each Corps had their own Sanitary Department with two wagons. “She reported to me on the 21st of August 1864, during a severe skirmish at and near Pickets House west of and near Charlestown, Va., showing papers detailing her as Hospital Nurse and assigning her to duty with the 2nd Div. 6th Corps. I then directed her to the field hospital of that division where she did efficient service on that day under Surgeon Allen, Surgeon Chief of that division, and subsequently. Mrs. Farnham always maintained a good reputation in the service in every respect. Lt. Maj. 49th N.Y.V. and Prov. Mar. 2nd Div. 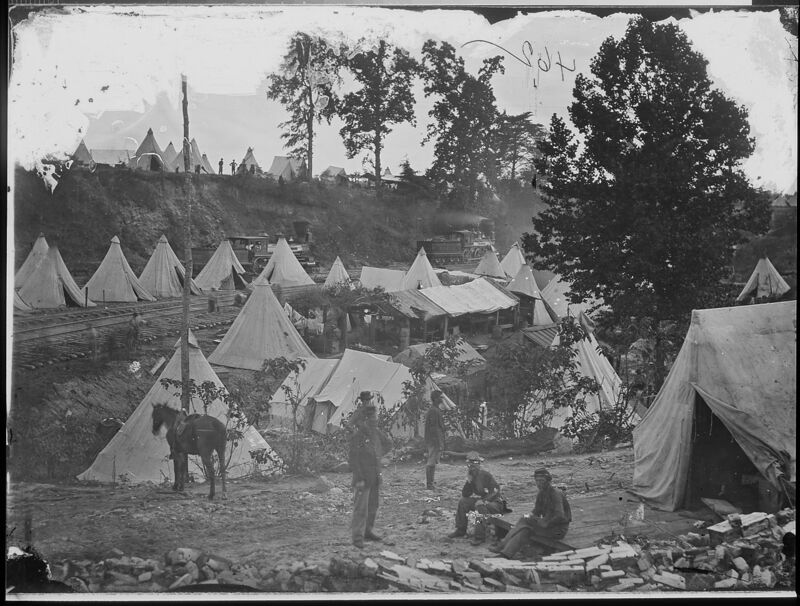 Marshall continued to serve as the hospital steward with the Vermont 4th. Amanda was serving at Fredericksburg, the White House on the Pamunkey, and her first stint at City Point. They probably crossed paths more than once. Beginning in early May and ending in early June of 1864 Marshall would have witnessed the most devastating six weeks of the war for the Army of the Potomac. 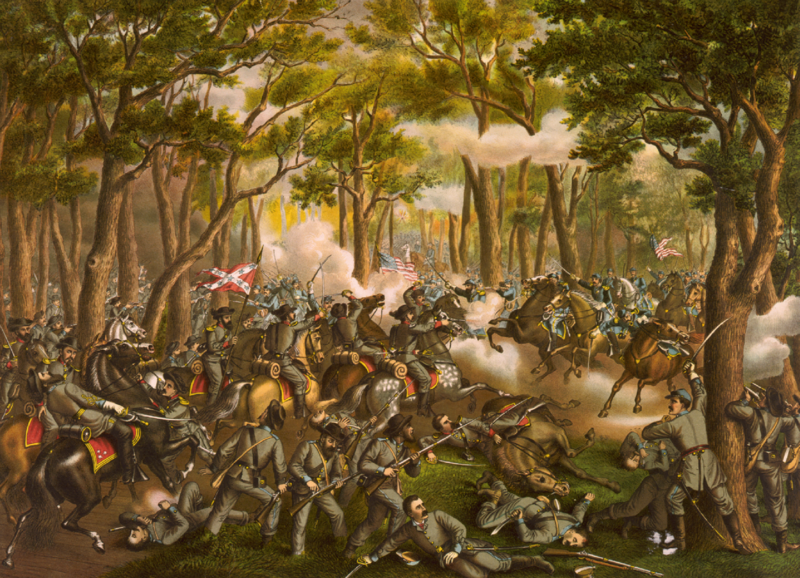 The Battle of the Wilderness was followed almost immediately by Spotsylvania and soon the horrible travesty at Cold Harbor. The Overland Campaign was essentially one long running battle in which over 80,000 men would end up dead, injured, or missing. A couple of weeks after Cold Harbor, the Army of the Potomac including Marshall crossed the James River on pontoon bridges in a well orchestrated crossing. 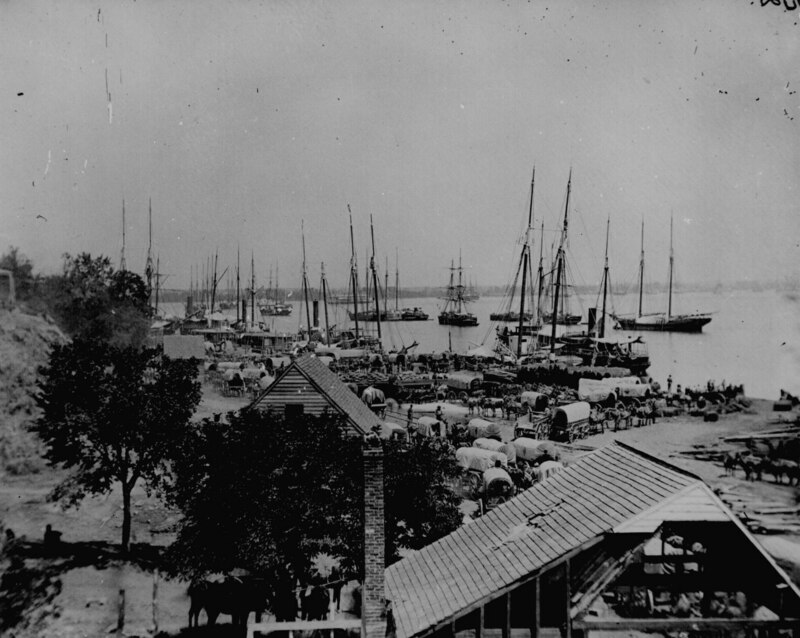 Grant’s Army was establishing a foothold on the west side of the James River at a place called City Point, a shipping harbor where they set up for the Siege of Petersburg. 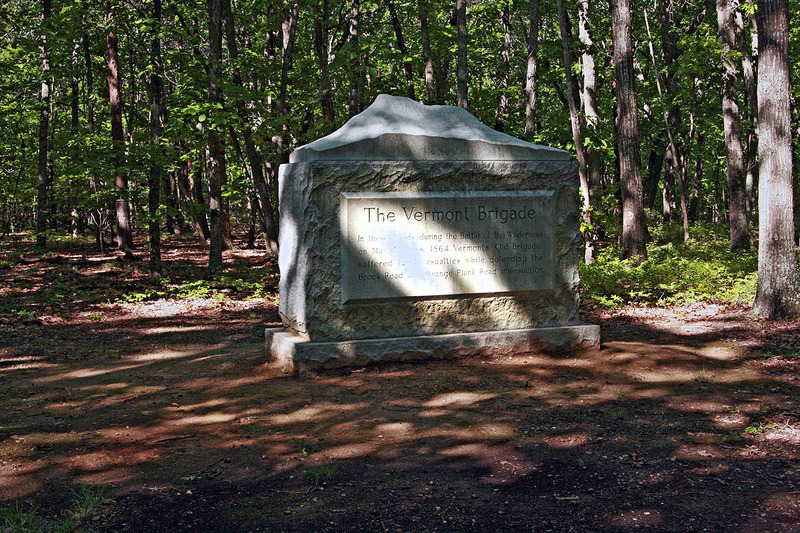 The siege started out rough for the Old Vermont Brigade on June 23 when a large number of Vermont soldiers were captured while tearing up railroad track during the first battle of Weldon Railroad. 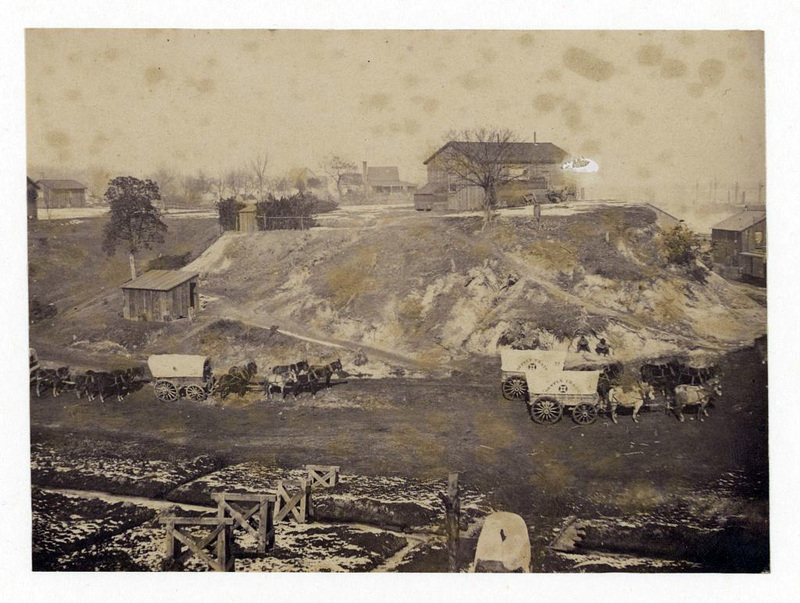 During the summer of 1864 there was a decision to send some Union troops back into western Virginia near the northern end of the Shenandoah Valley. The Old Vermont Brigade would be a part of that so naturally Marshall and later Amanda would soon be headed that direction. Marshall and Amanda would both serve in the Shenandoah Campaign in the fall. The battle of Cedar Creek would be both a terrible and wonderful day for the Old Vermont Brigade. It would also result in a life long injury for Marshall. Amanda would serve out the remainder of the war in a leadership role at City Point. 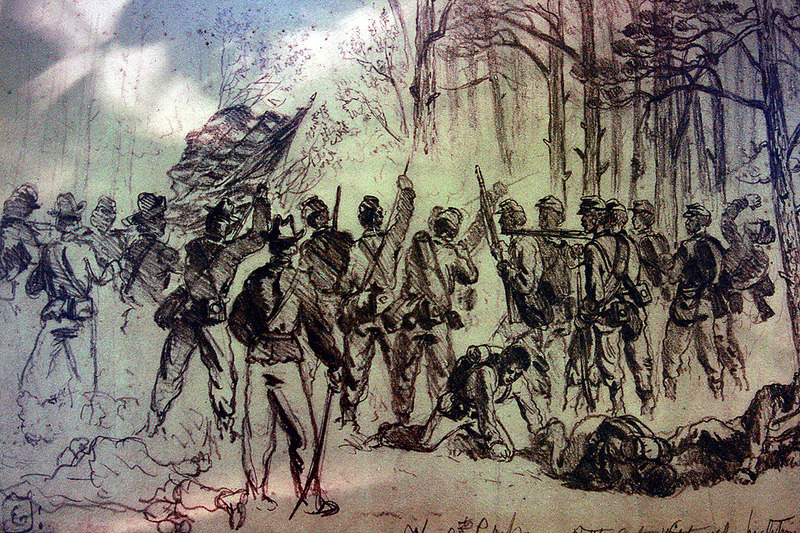 The Vermont troops would lead the way to the breakthrough of the Siege that soon ended the Civil War.